The parish of Burgh by Sands ('Burgh' being pronounced as 'Bruff') is situated in the extreme N.W. of Cumbria (previously Cumberland). It is near the the southern side of the Solway Firth. In the 21st Century Burgh by Sands is a generally a place of peace and tranquility. Yet, because of its geographical situation it has seen some turbulent times. In the days of the Roman Empire the present day Burgh by Sands was the site of the Roman fort Aballava, a principal fortification along Hadrian's Wall. According to local legend, during the Dark Ages Burgh by Sands was the site of Avalon where King Arthur died. It is also reputed that Avalon was where King Arthur's fabulous sword Excalibur (the 'Sword in the Stone') was forged. It was on the outskirts of Burgh by Sands, on the marsh overlooking Scotland, where the English king Edward I (1239 - 1307) died. At the time Edward I, also known as 'Longshanks' and the 'Hammer of the Scots' was leading his troops in a campaign to face the Scots led by Robert the Bruce. On 6 July 1307 Edward and his army were encamped at Burgh by Sands within sight of Scotland which is on the northern side of the Solway Firth. The following morning the 68-year old Edward died in the arms of his servants. 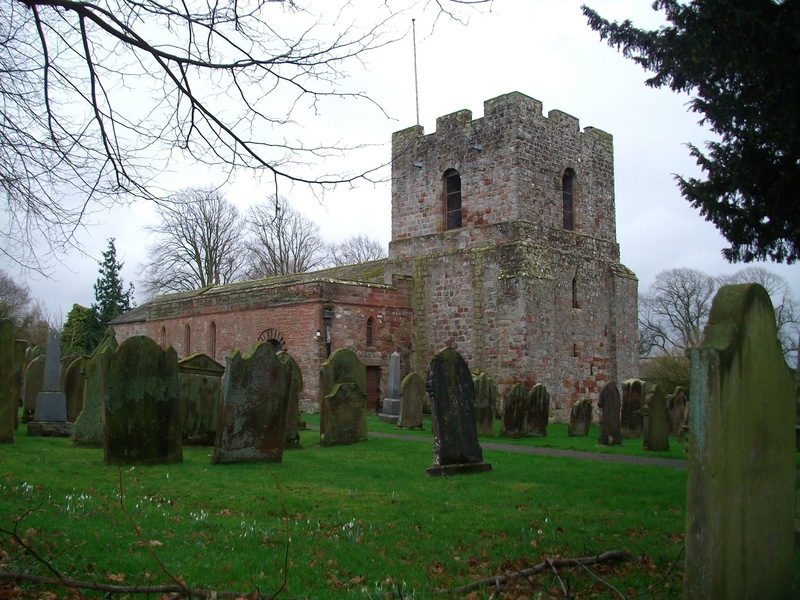 The king's body was initially taken to the fortified Parish Church of St Michael and All Angels (Photograph No 4 above). This church was largely built from stones taken from the nearby Hadrians Wall. After having lain in state at Burgh by Sands the king's body was taken to London where it was eventually buried in Westminster Abbey on 27 October 1307. 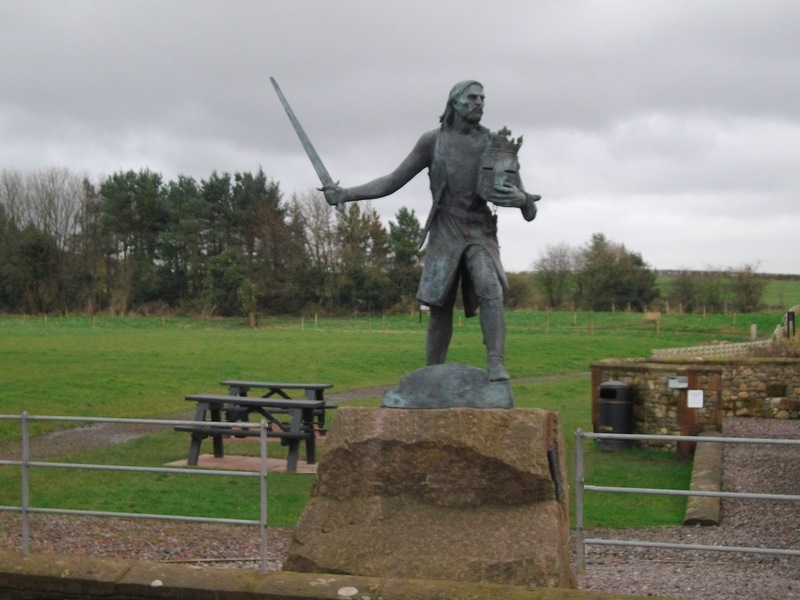 In 1685 a large monument dedicated to Edward I was erected on the marshes at Burgh by Sands to mark the place where he died. On 3 July 2007, a few days before the 700th anniversary of King Edward I's death at Burgh by Sands, one of his descendants, HRH Prince Edward, Duke of Kent, unveiled a new statue of King Edward I next to the village green. The statue can be seen in Photograph No 3 above. It is worth noting that one of the many roles undertaken by HRH the Duke of Kent is President of the Commonwealth War Graves Commission. His father, HRH Prince George Duke of Kent, a Group Captain in the R.A.F. in the early part of WW2, was accidentally killed in a plane crash in Scotland on 25 August 1942. Prince George, Duke of Kent, is one of the WW2 casualties commemorated by the Commonwealth War Graves Commission. The Burgh by Sands War Memorial was originally unveiled on 31 October 1921 to commemorate the 'Brave & Valiant Hearts' of the parish who lost their lives during the First World War (Photograph No 1). This monument is located in the churchyard extension of St Michael's Church. It takes the form of a Celtic cross. They gave their lives for Freedom and for Honour. Their example will be an abiding inspiration. Regiment/Service: Manchester Regiment, 17th Bn. Grave Reference: XXIX. E. 2. Cemetery: SERRE ROAD CEMETERY No.2, Somme (France). Son of Robert and Fanny Maria Calvert, of Burgh-by-Sands, Cumberland. Hastings Exhibitioner at Queen's College, Oxford. Grave Reference: III. A. 36. Cemetery: BROWN'S COPSE CEMETERY, ROEUX, Pas de Calais (France). Regiment/Service: Machine Gun Corps (Infantry), 12th Bn. Grave Reference: III. E. 8. Cemetery: DOINGT COMMUNAL CEMETERY EXTENSION, Somme (France). Son of Mr. T. Abbott, of Langworth Cottage, Low Moorhouse, Carlisle. Regiment/Service: Border Regiment, 1st Bn. Grave Reference: II. C. 15. Cemetery: MARCOING BRITISH CEMETERY, Nord (France). Memorial: THIEPVAL MEMORIAL, Somme (France). Regiment/Service: Border Regiment, "A" Coy. 11th Bn. Cemetery: BOUZINCOURT COMMUNAL CEMETERY EXTENSION, Somme (France). Husband of Maggie Bell Huddard (formerly Lightfoot), of Bank Cottage, Skinburness, Silloth, Carlisle. Regiment/Service: Machine Gun Corps (Infantry), 9th Bn. Grave Reference: I. D. 6. Cemetery: FEUCHY BRITISH CEMETERY, Pas de Calais (France). (Next of kin details not listed. Previously Border Regt.). Regiment/Service: Royal Scots, 15th Bn. Grave Reference: I. E. 3. Son of David and Catherine Little, of Amberfield, Burgh by Sands, Carlisle. Regiment/Service: Machine Gun Corps (Infantry), 50th Bn. Panel Reference: Panel 90 to 93. Memorial: POZIERES MEMORIAL, Somme (France). Husband of Margaret McCrone, of 4, Queen St., Spennymoor, Co. Durham. Regiment/Service: Border Regiment, 8th Bn. Grave Reference: II. B. 11. Cemetery: WESTHOF FARM CEMETERY, Belgium. Son of Mrs. Mary A. Percival, of Burgh-by-Sands, Carlisle. Regiment/Service: Duke of Wellington's (West Riding Regiment), 9th Bn. (Next of kin details not listed). Cemetery: JOHANNESBURG (BRIXTON) CEMETERY, South Africa. Cemetery: BURGH-BY-SANDS (ST. MICHAEL) CHURCHYARD, Cumberland. Son of Thomas and Fanny Story, of Cumwhinton, Carlisle. Regiment/Service: Canadian Infantry, 8th Bn. Grave Reference: III. B. 13. VILLERS-AU-BOIS, Pas de Calais (France). Regiment/Service: Border Regiment, 11th Bn. Son of William and Mary Jane Wilson, of Thurstonfield, Carlisle. 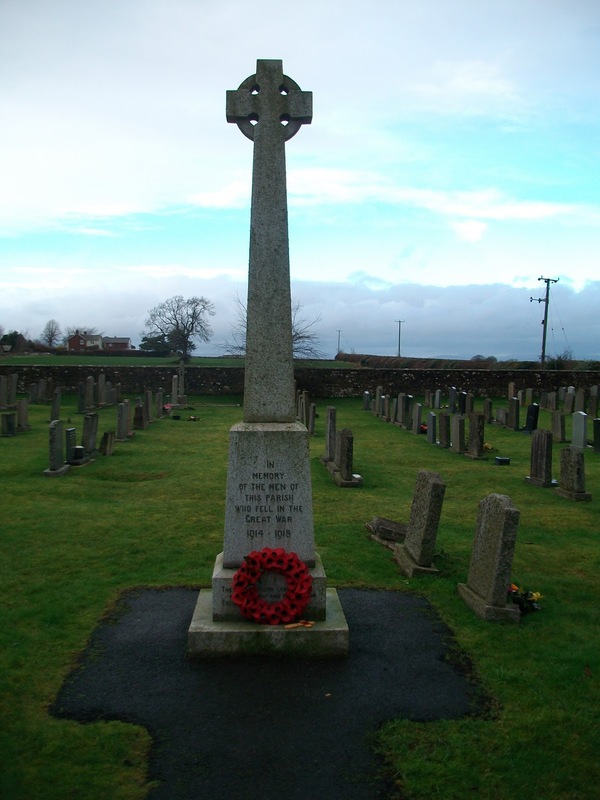 During the Second World War it is now believed that 10 'Brave Hearts' from the parish of Burgh by Sands lost their lives. In remembrance of their sacrifice, shortly after WW2 a bronze memorial tablet surrounded by a carved wooden frame was unveiled inside St Michael's Parish Church. 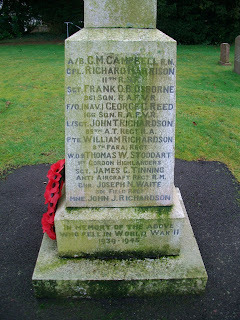 Until November 2009 the War Memorial in the churchyard commemorated only the 16 parishioners who had died during the First World War. During 2009 Burgh by Sands Parish Council and St Michael's and All Angels Parish Church Council collaborated to update the memorial in the churchyard by adding the names of the parishioners who had died during the Second World War (Photograph No 2 above). At the same time the memorial was cleaned and re-dedicated on Remembrance Sunday, 8 November 2009. Since WW2 the names of those who had died in the war had always been read out during the Remembrance Sunday service each November. Exactly why the names were not added to the memorial before 2009 appears to have been lost over time. “Quite why it never happened, I’m not sure. We always have a ceremony around the memorial and the names of those from World War Two are always read out with those from World War One. Now they are on the monument it is quite nice." Also, according to Rev. Hart, the re-dedication of the memorial in 2009 was not just for a stone or only about the past. The War Memorial is about people and remembrance is an on-going issue. There are still people who lose their lives as the result of wars and conflicts. The War Memorial is also a commitment for people to live peacefully. Panel Reference: Panel 37, Column 2. Son of Joseph and Mary H. Campbell, of Longburgh, Cumberland. Regiment/Service: Royal Scots Fusiliers, 11th Bn. Grave Reference: I. B. 8. Regiment/Service: Royal Air Force Volunteer Reserve, 961 Sqdn. Husband of Dorothy Osborne, of Redbridge, Hampshire. Regiment/Service: Royal Air Force Volunteer Reserve, 166 Sqdn. Grave Reference: 6. C. 1. Cemetery: BERLIN 1939-1945 WAR CEMETERY, Germany. Husband of Minnie Alexander Reed, of Burgh-by-Sands, Cumberland. Regiment/Service: Royal Artillery, 85 Anti-Tank Regt. Son of Mr. and Mrs. Albert Richardson, of Aspatria, Cumberland. Regiment/Service: The Parachute Regiment, A.A.C., 8th Bn. Cemetery: WATCHFIELD MILITARY CEMETERY, Berkshire. Husband of Phyllis Maisie Richardson, of Cattedown, Plymouth. Husband of Freda Stoddart, of Belle-Vue, Carlisle. A.A. Regt., R.M. Group. M.N.B.D.O. (1). Grave Reference: 5. C. 4. Cemetery: BELGRADE WAR CEMETERY, Serbia. Husband of Margaret Tinning, of Burgh by Sands, Cumberland. Son of Joseph Nixon Waite and Lydia Stordy Waite, of Burgh-by-Sands, Cumberland. Grave Reference: 9. A. 1. Son of William and Elizabeth Richardson, of Burgh by Sands, Cumberland. This article is dedicated to the 'Brave and Valiant Hearts' from Burgh by Sands, Cumberland who made the ultimate sacrifice during the two World Wars. Their sacrifice has not been forgotten. Words by Sir John Stanhope Arkwright (1872 - 1954).